First, on a quick spin around my garden, Peter’s Purple bee balm popped out to cheer on returning hummingbirds! Angelica pachycarpa in a shady bed is about to retire until next winter, but not before feeding a few pollinators. Plumbago and a new, native white mistflower (Ageratina havanensis) will take over when it goes underground. Thank heavens I don’t have running bamboo, but are you cursing neighbors who planted pesky golden or black bamboo years ago? Trisha turns that pest into a yummy freebie, bamboo shoots! See how to dig, cook, and preserve your own bamboo shoots for sweet, fresh taste to turn cursing into culinary wow. Daphne’s question this week comes from Jen Rhodes, whose pink Madame Isaac Pereire rose turned red. Well, the same thing happened to me! Daphne tells us that ‘Dr. Huey’ is the most commonly used rootstock in the rose breeding industry. After years of heavy pruning, or if the grafted rose dies, merlot-colored ‘Dr. Huey’ will send out new canes from roots below the graft union. Check the grower, since many, like the Antique Rose Emporium, only sell roses on native root stock, so your rose will never turn color on you. Now, let’s dive into the 2015 Austin Pond Society tour with BJ Jenkins! She and Tom preview just a few of the 20 on tour June 5 & 6. The tour’s a super way to get first hand tips and answers to all your questions. 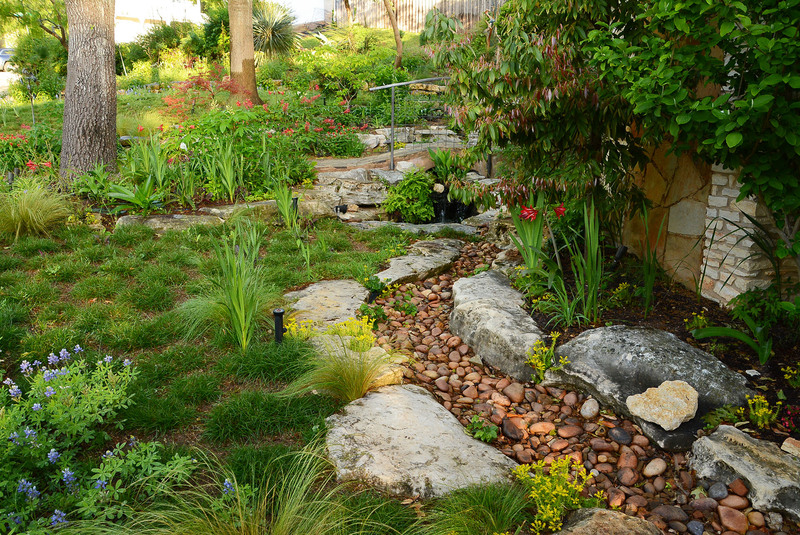 At each pond, the designer—whether backyard hobbyist or pond professional—will be happy to spare you the pitfalls of ponding and inspire your imagination. Actually, this is a GARDEN tour, too, where you’ll get lots of ideas for plant design, outdoor rooms, and garden art. In Leander, Betty and Gerald Ronga’s hillside ponds framed by native plants are just part of their charming gardens, including a colorful Spanish-styled courtyard. On Saturday, June 5, check out the north tour to see what’s changed in their garden since we taped it in 2011! Proceeds from the 2015 tour support Austin Police Operation Blue Santa! Find out more and get tickets online. In Liberty Hill, meet Alicia Froelich and Paul Ortner, who started mapping their pond even before they finished building the house! Although a kindly neighbor with a backhoe dug it, Alicia did all the rock work herself. Designing with rock is a first for Alicia. She’s become such a rock hound that she built dry stack and mortared walls and raised beds throughout the property. She and Paul scavenged many of the rocks from their property and various ranchers. Paul taught himself brick laying for the outdoor living room’s floor. Its pattern of red and gray was sort of a creative fluke with the colors he wrangled! Cattle panel forms their arbor where early spring-planted mandevilla will cover it by summer. With cypress from a friend’s felled tree and their own cedar (ashe juniper) prunings, they built accents and furniture, like this café table. Paul used cedar from drought-felled trees to signify the “formal” living room from the naturalistic one beyond. On their path to the greenhouse, you’ll spot lots of birds and other contented wildlife. After hours of physical labor, Alicia and Paul take a short break around the fire pit to plot their next project. One big project is their greenhouse, structured with recycled telephone poles and other discarded finds. Adjoining the greenhouse is their vegetable garden. To protect from deer and other foragers, Alicia used metal lathe over cement board to stucco the bottom. Then, she rocked around it. Since they’ve got more rocks than soil, she built raised beds. Painted rocks identify plants for friends who stop by. They designed their first concrete table top (later reinforcing the wooden support). Alicia found free granite leftovers to floor it up. All those dead trees came in handy for their cordwood and cinder block structure. It’s open on the back as their goat shed, since the day Alicia went to a goat cheese workshop and came home with a baby goat. Emma’s ankle birth defect ended her motherhood career to lactate for goat cheese. Later, they got her buddy, Bella. Jack, another rescue, helped raise Emma. Now they’re best friends. One of Alicia’s biggest projects was digging out and rocking a small lake, when a nearby creek’s runoff threatened to drown a favorite tree. Now, the neighbors all gather around it after work to relax and come up with more projects! You’ll also want to check out their rainwater collection system that provides all their house and garden water. See their whole inspiring story now!